New York state’s growth of the craft beer segment continues to be strong and New York State’s share of that growth has exceeded that of breweries on the national level. The number of New York state breweries grew from 95 in 2012 to 415 in 2018. The state’s craft beer industry is currently fourth in the country with an economic impact of $3.4 billion dollars. In 2018, New York state was the sixth largest beer producing state in the country. The outlook for breweries in New York state remains strong with more breweries-in-planning than ever, continued barrelage increases and growth in distribution in and out of state. In addition, with support from Gov. Andrew Cuomo and state legislators, breweries in New York are enjoying great success and are poised to continue making great beer, increase market share, and create more jobs. Today, peaks and Pints presents a flight of craft beer from New York that we call Craft Beer Crosscut 4.2.19: A Flight of New York. Brooklyn Lager won the Gold Medal for Amber Lager at the 2018 World Beer Cup because it’s one of the most refreshing Vienna lagers you’ll ever try. That malty nose showcases some caramel sweetness and some fruitiness, which is surprising considering this beer is brewed with lager yeast. It starts of very clean with a little bit of earthy hops and hints of hay malt up front that extends into the refreshingly crisp middle. The beer finishes with floral overtones and a strong toffee malt aftertaste. Decadent Ales brews in Mamaroneck, New York, and is distributed by Twelve Percent Beer Project, the brewery arm of Twelve Percent Imports, and contract-brewed at Thimble Island Brewing Co. and Dorchester Brewing Co. in Connecticut and Massachusetts, respectively. 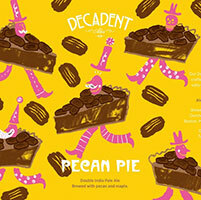 Decadent Ales excels at smoothie and milkshake IPAs, including their Pecan Pie IPA. This session IPA is hopped with Mosaic, before Decadent adds crushed pecans and burnt sugar reminiscent of pecan pie. Founded in 1997, Brewery Ommegang has been bringing Belgium to America with resounding applause. Designed with a traditional Belgian farmhouse in mind and built over a former hop farm in Cooperstown, New York, all of Ommegang’s beers are brewed with traditional Belgian ales in mind, courtesy of Belgian beer exert Don Feinberg. Brewery Ommegang’s Belgian strong dark ale Sirens’ Song is brewed with Pilsner, Midnight Wheat and soft Red Wheat malts, as well as noble hop varieties for balance. In addition to dark Belgian candi syrup, figs and raisins are thrown into the kettle for not only added complexity but also to represent cargo lost to the sea because of the bewitching sirens’ songs. Aromas of roasted malt and dark fruit are pronounced. The flavor begins with sweetness and caramel notes and finishes smooth with lingering hints of caramelized sugar and balanced bitterness. Jeppe Jarnit-Bjergsø, the founder and man behind Evil Twin Brewing, was a physics and English teacher in his native Denmark before starting Copenhagen’s Ølbutikken, a highly regarded beer store. He’s also an evil twin himself. His brother, Mikkel Borg Bergsø, brews under the Mikkeller label. Jarnit-Bjergsø, however, has done his best to outshine the good twin. He founded Evil Twin in 2010 as a nomadic brewery. Like his brother Mikkel, Jarnit-Bjergsø would concocts a recipe for his beer and hand it to another brewery with some extra capacity. In 2012, Jeppe Jarnit-Bjergsø moved it to Brooklyn and relocated there with his family, opening the beer bar TØRST the same year. In November 2018, he’ll finally open a permanent production facility in Brooklyn’s Ridgewood neighborhood. To make matters more interesting, Evil Twin comes hot on the heels of the opening of his rival brother’s brewery Mikkeller in Queens. What’s up with Evil Twin’s fascination with Jesus? Well, it arose during non-Christian Jeppe Jarnit-Bjergsø’s pricing email exchange with a business partner. One particular price caused the brewer to write, “Jesus, this is expensive.” The next email received had an even higher price listed prompting, “even more Jesus.” What followed was a string of craft beers with “Jesus” in the name, including Even More JCs, an “affogato-style imperial stout” brewed with lactose and conditioned on coffee and vanilla beans. An affogato, which translates to drowned from Italian, is a coffee-based drink that is usually made up of a shot of espresso poured over a scoop of vanilla gelato or ice cream. The aroma and flavor isn’t surprising: sweet milk chocolate, light vanilla and a hint of coffee.